Organize your suitcase with a range of wetbags. I love using wet bags while traveling. It’s a satisfying feeling top open up a suitcase and see everything completely organized and easy to find. As the holiday season draws near, families will be on the move visiting relatives and delivering gifts. Keeping everything in order, especially for a family with small children, can be a challenge. That’s why Cotton Babies, Inc. has expanded its line of bumGenius™ wet bags. Now ranging from the Mini Wet Bag all the way up to the Hangout Wet Bag, the company offers bags that make packing and organization easy and colorful. Packing can be overwhelming, especially for moms who are in charge of making sure all the kids have all the things they need. To make matters worse, often all the contents of a suitcase shift around while traveling. When families finally get to a destination, the inside of the suitcase is a mess. All of the clothes are mixed up. When one child tries to find what they’re looking for, an organized suitcase can quickly turn to chaos. Wet bags can help organize a suitcase for vacation by separating items or outfits for each family member, transporting wet clothes or swimsuits, store a back-up outfit for potty training kids, shoe or cosmetic storage and much more. All bumGenius wet bags are made from washable and leak-resistant material. bumGenius Mini Wet Bag – A great solution for toiletries while traveling. Keep everything dry from a leaking shampoo or wet toothbrush. bumGenius Outing Wet Bag – Easily transport an outfit, socks or undergarments for each person. Weekender Wet Bag – This roomy bag makes organizing suitcases a breeze by packing each family members’ clothes in a separate bag. Hangout Wet Bag – This hanging wet bag is an ideal for storing dirty clothes while traveling. Just hang it on a doorknob to keep it out of the way. By separating clean from dirty clothes, families can contain any stink and make unpacking a bit easier. 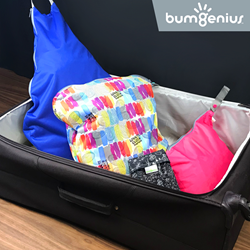 All bumGenius Wet Bags are available in a wide range of solid colors and a multitude of fun prints, including the Genius Series. You can choose a color or print for every member of the family to keep things organized. Shop for Wet Bags and find holiday gifts for everyone on your list at cottonbabies.com. Calling Fenton, MO home, Cotton Babies is a privately held market leader in the juvenile product industry and a diverse retailer, offering cloth diapers and a wealth of other products designed to make parenting easy. Cotton Babies is a socially active organization supporting outreach and diaper grant programs for financially underprivileged families. CEO Jennifer Labit is a founding chair of the Real Diaper Industry Association for manufacturers, retailers, diaper services, health care providers, and other parties interested in supporting the cloth diaper market. Cotton Babies products are sold on CottonBabies.com and through independent juvenile products stores and major retailers. Cotton Babies diaper brands include bumGenius™, Flip™, and Econobum™. Find Cotton Babies on Facebook, Pinterest, and the OEKO-TEX® Buying Guide.